Where can I find what I purchased? Yes! We have an extensive group of free resources you can access here. If you have a question about my website, your account, or any other general question, feel free to email us at Support@HomeHighSchoolHelp.com. We will always get back to you within 24 hours (excluding weekends), and usually the same day. If you have general questions about homeschooling high school, check out my articles, blog and social media pages. If you detailed questions regarding your specific family situation, consider one of my products (see "Store" in the menu), which deal with the most difficult home high school problems. If you need personal help and support, consider joining my Gold Care Club, which will provide you with personal coaching and guidance to help you through even the most difficult homeschooling situations. What is the difference between your digital products? We offer homeschooling high school help for parents at every stage of homeschooling. You can get a quick overview of the differences between our main products here. Explore our products more in-depth by clicking on the "Learn More" links on the slide show at the top of our homepage. Here's a quick summary in case that's all you need: The Total Transcript Solution centers on transcripts. With the tools, templates and training included, you will be able to create transcripts that will exhibit all the work your student has done. You will learn how to assign grades, calculate high school credits and even how to include delight-directed learning on your transcripts. The Total Transcript Solution comes with an in-depth personal consultation with Lee either by phone or email. The Comprehensive Record Solution zeroes in on producing thorough records. All the training classes, tools and templates are specifically directed at that purpose. You will have the ability to create well organized documentation that completely reflects your individual students and all of their unique strengths. Also, when you are ready, you can send four documents in and receive feedback from Lee on your progress. The High School Solution focuses on helping parents set up a great high school plan. It includes lots of information on every age and stage of high school. It is best for parents considering or starting high school who want to get off to a strong start and have a resource to answer their questions. The High School Solution is a group of many classes all in one place for the parent to work on independently. And some people just like things all in one place, rather than having to ask me for them. If you are a very eager learner, this option is perfect. The Gold Care Club gives you extensive parent resources that are refreshed each month, including training courses, tools, and templates. The key feature of the Gold Care Club however, is the personal one-on-one support. With the Gold Care Club you can get any class you need or ask for, one at a time. If you want encouragement, or learn best in relationship, this option is for you. The Silver Training Club is a "do-it-yourself" training resource for parents looking to increase their knowledge and abilities for homeschooling high school over time but who do not need the same level of personal support offered by the Gold Care Club. Included are most of the same resources as the Gold Care Club without the personal coaching. If you are a self motivated learner or have an existing strong support group, this option is for you The key difference in these resources is focus. All of The HomeScholar resources have a lot of information, but each concentrates on a different need. Since every child is different, you are smart to invest in a product that will help you meet the needs of each one. Which of your homeschool records products is best for me? 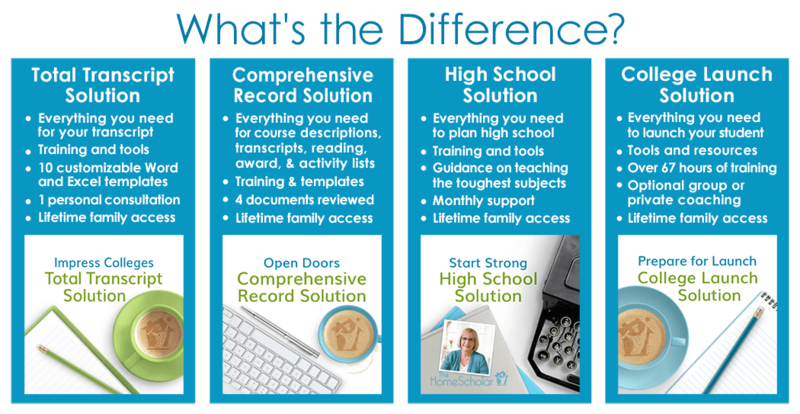 If you feel overwhelmed with the thought of record keeping, I would suggest that you start with the Total Transcript Solution. It comes with one month free of the Silver Training Club, which can answer your "overwhelmed" feelings, plus it has a personal consultations so we can talk about your unique situation. If you later decide to purchase the Comprehensive Record Solution, it's always $50 off for Total Transcript Solution customers, which covers the cost of the Total Transcript Solution! The Comprehensive Record Solution is very in depth, with tons of information that might cause some anxiety if you aren't quite ready to tackle complete records. If you are ready and eager to get your comprehensive homeschool records DONE, you will find the Comprehensive Record Solution invaluable in helping you get through the task as quickly and painlessly as possible. Both products are great to couple with a Gold Care Club membership so you and I can talk each week and get your specific questions answered. The coaching and personal mentoring that is part of the Gold Care Club is why I have some members who have been with me for over eight years now. If you still aren't sure, then I suggest you start with the Total Transcript Solution and later add the Comprehensive Record Solution as you build your confidence. Yes! You can register for my free monthly email newsletter by clicking on the ‘Menu’ tab on the top right of the home page of my website. Hover over the ‘Freebies’ tab, then click on ‘Free Monthly Newsletter’, or just clicking here. Enter your information to receive the latest information to your inbox monthly! Yes! To subscribe to my blog, simply click on the ‘Menu’ tab at the top of the home page of my website. Click on ‘Blogs’. Once you are on the blog home page, you will see a place on the right side of the page with a blue bar that says ‘Subscribe to our blog’. Enter your name and email there and you will be registered. It’s as easy as that to get a notification each time I have a new blog post with information to help you on your homeschool journey! Will HomeScholar products work on a Mac? For pdf files you just need the Mac version of the free Adobe reader. How do I register for my account on the new HomeHighSchoolHelp.com site? In order to use the new HomeHighSchoolHelp.com site, you will need to register here. (Please use the email address connected with your account and any purchases on TheHomeScholar.com website.) When you do that, you will be sent an email with your new username and your new password. You will use these new credentials to login to the member’s page on the new HomeHighSchoolHelp.com site. Changing your password is easy! Simply click on the “Login/Password” button at the top of HomeHighSchoolHelp.com. Once you are there, scroll to the bottom and click on the ‘Change your password’ link. Enter your email address associated with your account and click the ‘Submit’ button and you will get an email. Follow the instructions from there. We do encourage you to keep a secure password including upper and lower case letters, numbers, and at least one symbol. No. You cannot change your username. The username you use when you register is the username that you will have forever. If your username was set as your email address, you may go in and change the email address that you want to get emails sent to, but your username will not change. How do I recover my username if I’ve forgotten it? Recovering your username is easy! Simply click on the “Login/Password” button at the top of HomeHighSchoolHelp.com. Once you are there, scroll to the bottom and click on the ‘Recover your username’ link. Enter your email address and click the ‘Submit’ button and you will get an email. Follow the instructions from there. I am a member on the old site but I can’t login in to the new site. Why? In order to use the new HomeHighSchoolHelp.com site, you will need to register here. (Please use the email address connected with your account on TheHomeScholar.com website.) When you do that, you will be sent an email with your new username and your new password. You will use these new credentials to login to the member’s page on the new HomeHighSchoolHelp.com site. First, register with the new HomeHighSchoolHelp.com site. (See instructions above.) Once you have a registered account, you can login on our member’s page and click on the ‘Menu’ tab on the top right. After you click on ‘Menu’, hover over the ‘Member’s Area’ tab that has the drop down arrow. Click on ‘Your Credit Cards’ to access your current credit card information. Click the green ‘Add New’ button at the bottom and add your current credit card information. AFTER you add the new card information, you can delete the old card information. VERY IMPORTANT: You will only show credit card information on the HomeHighSchoolHelp.com.com website AFTER you have made a purchase on the site. Credit cards used to make purchases on TheHomeScholar.com website will not show up on HomeHighSchoolHelp.com. First, register with the new HomeHighSchoolHelp.com.com site. (See instructions above.) Once you have a registered account, you can login on our member’s page and click on the ‘Menu’ tab on the top right. After you click on ‘Menu’, hover over the ‘Member’s Area’ tab that has the drop down arrow. Click on ‘Edit Your Profile’. There, you can change your email address where you wish us to send you emails. Please Note: If your username is your email address, changing the email field in your profile will not change your username. The username you signed up with is fixed and can not be changed. How can I learn out about upcoming events? My upcoming events are listed on the front page of my website. By scrolling to the bottom of the Home Page, you will see a blue bar labeled ‘Upcoming Events’. It changes each month, so be sure to check it out often! What should I do if I am unable to get my username and password to work on HomeHighSchoolHelp.com.com? If you have already registered, it may be that you will need to clear your cache and try again. Sometimes when you try to log in and have problems, your internet browser will “remember” that access was denied, so before you try again, please clear your browser’s cache. Here are instructions on how to clear the cache: Clear your cache. If you continue to have trouble logging in, please email us at Support@HomeHighSchoolHelp.com. Why am I having trouble viewing videos on my iPhone? There is a known iPhone issue about playing certain types of videos. You can view these videos without issue on your desktop or Android phones and on some older iPads. How do I cancel my subscription to the Silver Training Club or The Gold Care Club? This will depend on whether your subscription to the Silver Training Club or the Gold Care Club was made on TheHomeScholar.com website (generally in 2016 or earlier) or on HomeHighSchoolHelp.com.com (generally in 2017 or after.) For purchases made on TheHomeScholar.com, the cancel your subscription process is unchanged. Just email us at Member@HomeHighSchoolHelp.com. If your purchase was made on HomeHighSchoolHelp.com, first login on our member’s page and click on the ‘Menu’ tab on the top right. After you click on ‘Menu’, hover over the ‘Member’s Area’ tab that has the drop down arrow. Click on ‘Your Subscriptions’. There, you will see your subscriptions listed. There is a red ‘Cancel’ button that you can click on to end your subscription. You will always have access to your original purchase but your access to the Silver Training Club or Gold Care Club will end after the current pay period has expired. If you have any trouble cancelling, please email us at Member@HomeHighSchoolHelp.com.